^ Kavka, František (1998). "Chapter 3: Politics and culture under Charles IV". In Teich, Mikuláš. Bohemia in History. Cambridge University Press. p. 60. ISBN 0-521-43155-7. Jaschke, Karl-Ulrich (1997). "From Famous Empresses to Unspectacular Queens". In Duggan, Anne J. Queens and Queenship in Medieval Europe. The Boydell Press. 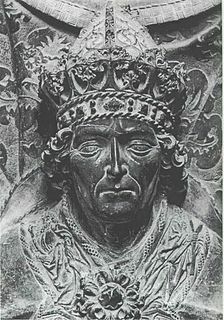 Jobst of Moravia, a member of the House of Luxembourg, was Margrave of Moravia from 1375, Duke of Luxembourg and Elector of Brandenburg from 1388 as well as elected King of Germany from 1410 until his death. Jobst was an ambitious and versatile ruler, who in the early 15th century dominated the ongoing struggles within the Luxembourg dynasty and around the German throne. 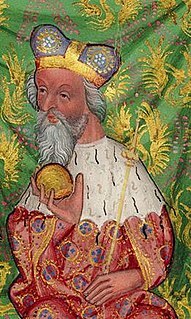 Ottokar II, the Iron and Golden King, was a member of the Přemyslid dynasty who reigned as King of Bohemia from 1253 until his death in 1278. He also held the titles of Margrave of Moravia from 1247, Duke of Austria from 1251, Duke of Styria from 1260, as well as Duke of Carinthia and Margrave of Carniola from 1269. Elizabeth of Pomerania was the fourth and final wife of Charles IV, Holy Roman Emperor and king of Bohemia. Her parents were Bogislaw V, Duke of Pomerania, and Elisabeth of Poland. Her maternal grandparents were Casimir III, King of Poland, and Aldona of Lithuania. 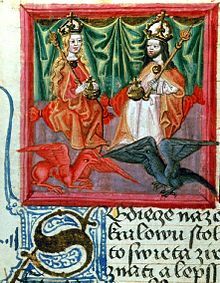 Joanna of Bavaria, a member of the House of Wittelsbach, was German queen from 1376 and Queen of Bohemia from 1378 until her death, by her marriage with the Luxembourg king Wenceslaus. 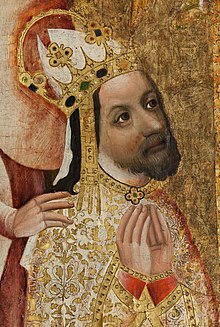 The Treaty of Trentschin was concluded on 24 August 1335 between King Casimir III of Poland and King John of Bohemia as well as his son Margrave Charles IV. The agreement was reached by the agency of Casimir's brother-in-law King Charles I of Hungary and signed at Trencsén Castle in the Kingdom of Hungary. It initiated the transfer of the suzerainty over the former Polish province of Silesia to the Kingdom of Bohemia, whereafter the Duchies of Silesia were incorporated into the Bohemian Crown. Joanna Sophia of Bavaria was the youngest daughter of Albert I, Duke of Bavaria and his first wife Margaret of Brieg. She was a member of the House of Wittelsbach. 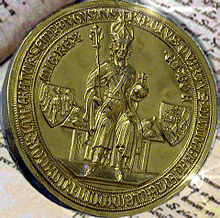 John of Görlitz, a member of the House of Luxembourg, was the only Duke of Görlitz (Zgorzelec) from 1377 until his death. The Bohemian Palatinate, since the 19th century also called New Bohemia, is a historical area in the northeast of present-day Bavaria (Germany), which from 1353 onwards was incorporated into the Crown of Bohemia by Emperor Charles IV. 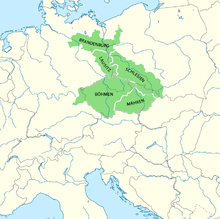 The Bohemian Palatinate lay in the north of the Upper Palatinate, its territory stretching up to Upper and Middle Franconia close to the Free Imperial City of Nuremberg.